Viral or Bacterial Sinus Infection? What the Difference? 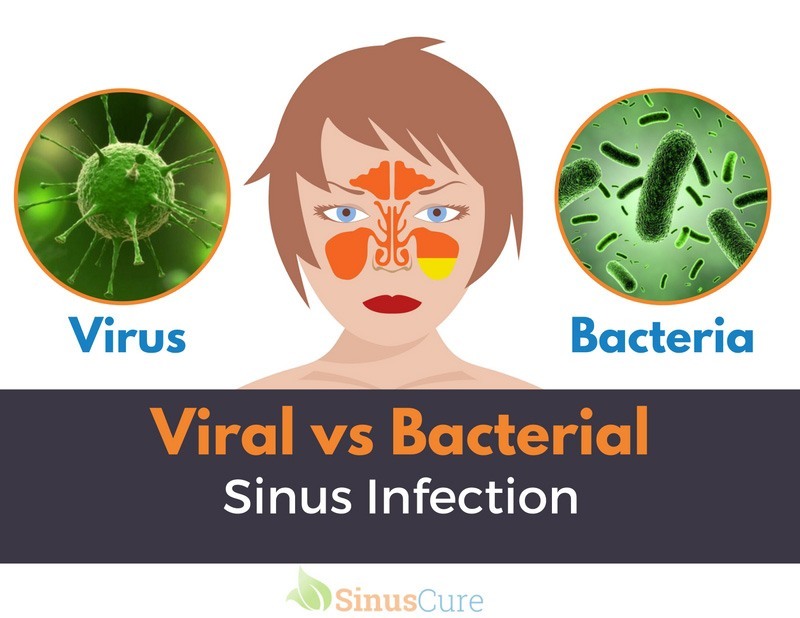 What is the difference between viral and bacterial sinusitis? Obviously, the first difference is the pathogen that caused the inflammation of the facial sinuses. It may be a virus or bacterium. Each type of inflammation occurs and must be treated differently. So, what are the differences and why these two kinds of inflammation cured differently? Which Virus Cause Sinus Infections? How long do viral sinus infections last? Are Viral Sinus Infections Contagious? How Long Are Viral Sinus Infections Contagious? Will Antibiotics Help a Viral Sinus Infection? Can a Viral Sinus Infection Become Bacterial? Which Bacteria Cause Sinus Infections? Can Bacterial Sinus Infections Go Away without Antibiotics on Their Own? According to statistics, viral infection - is the most common cause of sinusitis and rhinosinusitis. All of these viruses infect upper respiratory epithelium, resulting in developing edema of the nasal mucosa, nasal passages, trachea, and bronchi. Edematous tissue also produces significant amounts of mucus discharge, leading to a runny nose. And depending on which virus causes the illness, there is a risk of joining another URI ﻿﻿ diseases - bronchitis, pharyngitis, laryngitis, or tonsillitis. Viral infection of the respiratory tract (URI), including viral sinusitis, is the most important risk factor for more severe bacterial sinusitis. Viral sinusitis occurs in over 90% of people with upper respiratory tract infection. However, only 5-10% of these patients have a risk of escalation of the initial viral infection into bacterial. In other words, if you have an infection of the upper respiratory tract, such as colds, 9 out of 10 chance that you also have a viral sinusitis. And if so, you have one chance out of 10 that your sinusitis turns into a bacterial sinus infection. Viral sinusitis tends to appear on the background of the available acute respiratory viral disease in about 3-5 days after infection. Pathogens are the same viruses that cause the development of acute respiratory infections. 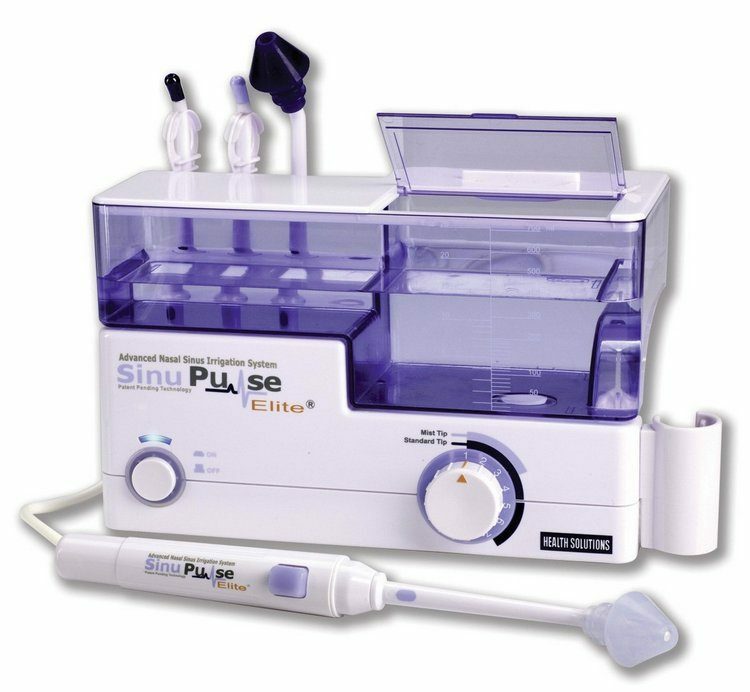 Within 5-7 days after the onset of symptoms of acute viral sinusitis in 98% of cases, there is a complete self-healing. Fever is rarely above 100.4 °F (38 °C). There are more than 200 viruses that can cause acute respiratory viral infections. But almost all of them are treated the same way. Treatment of viral sinusitis is not burdensome for either the doctor or the patient. In a normal immune response, the viral infection is eliminated by yourself. Saline solutions. Nasal sprays containing sea salt or isotonic solutions of sodium chloride. 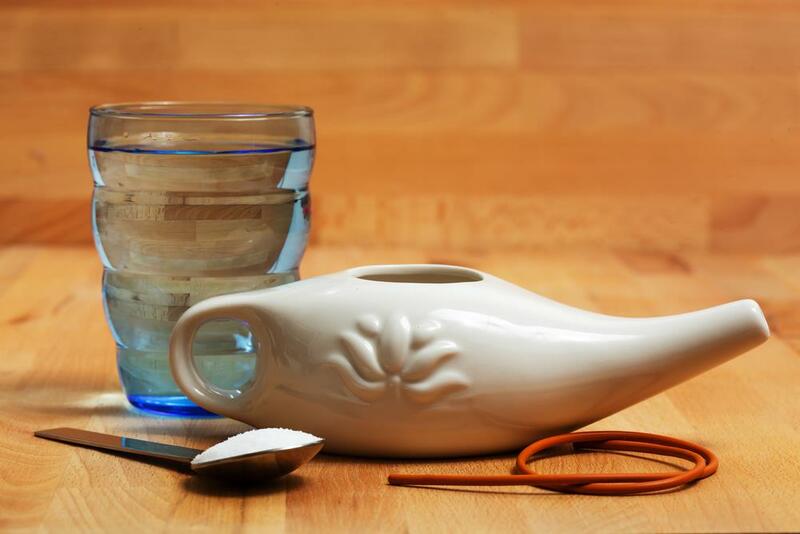 It is used to moisten the nasal mucosa, reducing the viscosity of mucus and facilitate its clearance from the sinuses. You can prepare it yourself. Unfortunately, yes it's very contagious. The coughing and sneezing that accompany these infections can release droplets into the air that can be inhaled by people nearby. This can spread the infection to them. More than any other vulnerable children, the elderly and people with reduced immune response. Well, the duration often lasts until your symptoms completely resolve. In other words, if you still have a runny nose and are coughing, chances are you are still congaious. No, they will not help. You do not need antibiotics. It just doesn't give any positive result (sour﻿c﻿e). These drugs have no effect against viruses, but they can improve antibiotic resistance. And if you suddenly will need treatment for a bacterial infection, already applied in curing viral sinusitis antibiotic will be ineffective. I also want to add that a viral inflammation of the sinuses cannot be chronic. There are only two ways of development acute viral sinusitis: complete self-healing or complication in the form of bacterial infection. The last results in a new, more severe disease - bacterial sinusitis. Yes. Acute bacterial sinusitis is closely related to viral upper respiratory tract infections. Symptoms of bacterial sinusitis are more pronounced than in the viral form. Also, it is changing the nature of discharge from the nose - they are opaque and colored in green, white or yellowish color. Fever during bacterial sinusitis is also generally higher than in the viral form and may reach 104 °F (40 °C). Also, much heavier flows intoxication syndrome - develop severe weakness with profuse sweating. Bacterial sinusitis is more terrible illness than the viral form of it. This is due to the severity of symptoms as well as the fact that bacterial sinusitis tends to move into the chronic form of the disease, the treatment of which is much harder than in the acute period. Besides, chronic sinusitis, like any other chronic inflammatory process, flowing with exacerbations and remissions, and in this case, the aggravation may occur even when a light form of the common cold. Streptococcus pneumoniae. It's about 20-43 % cases of the acute bacterial sinusitis in adults. In recent years, scientists have noted the increased resistance of microorganisms to antibiotics. Moraxella catarrhalis. It accounts for 2-10% of acute sinusitis cases. About 98% of the bacteria allocated from the paranasal sinuses are resistant to beta-lactam antibiotics. Because of this, much more challenging treatment of the disease. In 10% of cases of acute bacterial sinusitis associated with Staphylococcus aureus, which is also resistant to many different antibiotics. The main tasks of combined therapy are a discharge of pathological secretion from the paranasal sinuses, reducing the symptoms and suppression of infection. Acute sinusitis caused by a bacterial infection rarely goes away on its own and can lead to chronic sinusitis with complications. Unlike the viral infection, during bacterial infection, antibiotics is required. It is anti-bacterial drugs are first-line agents. And they cannot be neglected in any case. Treatment should start with the use of broad-spectrum antibiotics. Basically, it Penicillins. 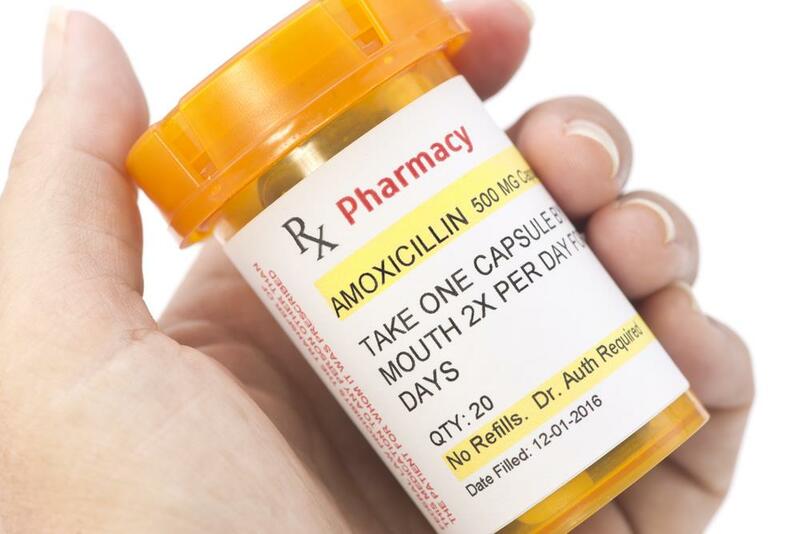 Because some of the sinusitis pathogens produces substances that destroy penicillin molecule, when possible, you should use the so-called «protected penicillins» - Augmentin or Amoxicillin. Another critical component of the successful treatment is drainage﻿ of the paranasal sinuses. Antihistamine (anti-allergic) drugs are completely ineffective in bacterial sinusitis. Moreover, antihistamines can cause extremely undesirable drying of mucous. Therefore, they should not be taken with the non-allergic inflammation of the sinuses. 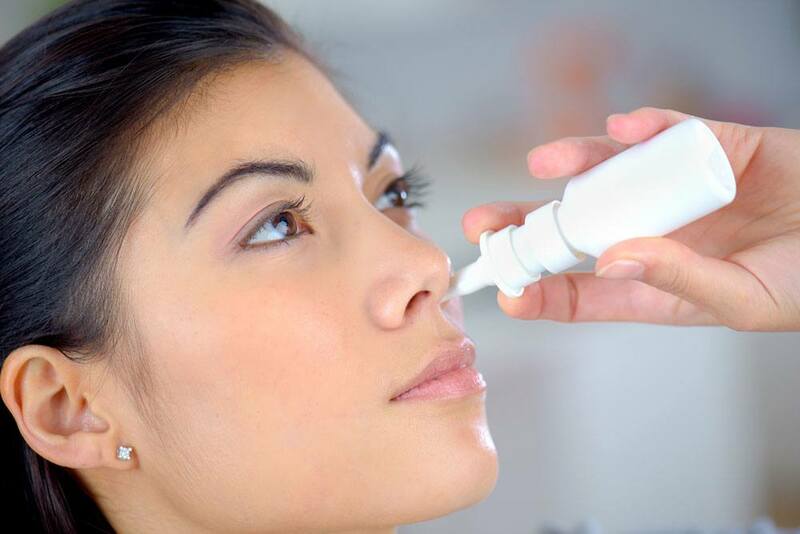 Some experts believe that it makes sense to apply intranasal formulations containing corticosteroids. This view is entirely justified. It proved that nasal drops with Fluticasone, and other corticosteroids which can reduce the duration of symptoms compared to placebo. The course of treatment is 15 to 21 days and multiplicity of applying - twice a day. The good effect gives physiotherapy - UHF in the region of the sinuses or laser therapy. Furthermore, it is necessary that the air was humidified sufficiently, stop smoking, use warm compresses and a balanced diet. You can also apply various inhalation, massage, nasal lavage and take bracing means. Vaporizer vs. Humidifier: What’s the Difference? I have had a sinus infection for four months. three rounds of antibiotics and two rounds of steroids. Nothing has worked. I am scheduled for surgery in March. Is there anything I can do other than surgery? Chronic sinusitis that is not resolved by antibiotics is most likely caused by a fungus (instead of by a virus or by a bacteria). Try Diflucan. im 16. My nose is constantly stuffy but there is no mucus and very little drainage but it makes breathing a bit difficult. My jaw is a little sore and my ear constantly feels fulls and starts ringing or buzzing sometimes. Sometimes there is also sharp pain in my ear. I use to have fluid in my ears but now its mostly gone and my ear still feels full. Today the left side of my neck got a little swollen from the inside and i had a bit of trouble breathing and just felt alot of discomfort. I went to the ent specialist once but i feel like he’s a bit incompetent and doesnt really care. Can u maybe give me an idea about what u think is wrong. and forehead..I went to my allergist and she said I needed to see a ent. I went to my doctor and he said I had sinus infection band put me on antibiotics. My sinuses are too dry and with the swelling and headaches, i’m Beside myself. Pleased let me know if you know what this is, the antibiotics worked for about a week and then it came back worse than ever.